Sussex all-rounder Chris Jordan’s Sydney Thunder failed to qualify for the Big Bash League semi-finals - but Jofra Archer’s Hobart Hurricanes finished top of the table. Thunder won their final game of the tournament, beating the Hurricanes at home by four wickets under the Duckworth Lewis method on Saturday. With the game initially reduced to 19 overs, the Tasmanian side set a target of 165-4, with George Bailey top-scoring with 53 from 35 balls, but was run out by Jordan. Matthew Wade and Ben McDermott contributed with 45 and 44 not out respectively. Jordan bowled 0-34 off his four-over spell. In Sydney’s reply, Australian internationals Callum Ferguson (47) and Usman Khawaja (36) got their side off to a positive start and in prime position. Chris Green (34*) and Pat Cummins (10*) got the Thunder over the line with four balls to spare. Archer took 1-22 from 3.2 overs. This meant the Melbourne Stars had to win their final game on Sunday in order to knock the Thunder out which they did in beating the Sydney Sixers by a comfortable 94 runs. Jason Gillespie and Rashid Khan’s Adelaide Strikers - already out of the running - finished on a high with a win at home to the Perth Scorchers as Khan took 2-22. The Scorchers won the toss and elected to bat first. Josh Inglis top-scored with 55 off 37 balls, with captain Mitchell Marsh scoring an unbeaten 50. The hosts were set a target of 175, and got over the line with four balls to spare as Jonathan Wells top-scored with 69 off 42 balls and Harry Nielsen finished the job with an unbeaten 44. 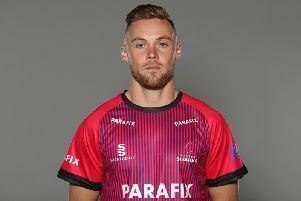 Archer is the only Sussex representative left in the BBL, and his Hurricanes side will play at home in the first semi-final against the Stars. That match will take place this Thursday (February 14) at 8:30am GMT, and the winners will face either the Melbourne Renegades or the Sixers in Sunday’s final. Meanwhile Sussex teammates Laurie Evans and Phil Salt are set to feature in the Pakistan Super League. Evans will play for the Multan Saltans, while Salt will represent Islamabad United. The tournament gets under way on Thursday and will feature Salt’s Islamabad United hosting Lahore Qalanders in Dubai on day one, while Evans’ first game with the Sultans first game, against the Karachi Kings will take place on Friday.